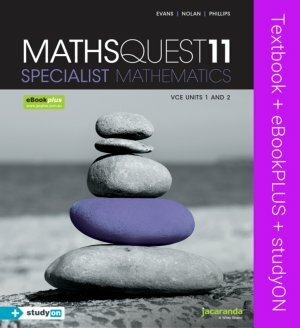 Maths Quest 11 Specialist Mathematics VCE Units 1 and 2 with eBookPLUS and studyON VCE provides comprehensive coverage of the new VCE Study Design for 2016-2019. It includes Jacaranda’s unique exam preparation tool, studyON, which has been fully integrated with the text to maximise every student’s opportunity for exam success. • Many HTML5 interactivities are available. These are designed to engage, excite and enhance understanding by bringing difficult concepts to life. • The theory is written by highly experienced and successful teachers with a proven and fundamental understanding of how students learn mathematics and succeed in exams. • Every exercise contains three levels of carefully graded questions which allow students to practise, consolidate and master their knowledge independently. • Thousands of new questions have been written exclusively for this series, including many higher level questions that stretch students’ understanding of mathematics for improved learning outcomes. • CAS support is provided within the student text through activities and questions. Additionally, students can obtain detailed step-by-step instructions by accessing the TI-Nspire CAS or the Casio ClassPad II Calculator Manuals in the Prelim section of their eBookPLUS. • studyON VCE Specialist Mathematics Units 1 and 2 is fully integrated with the student text. studyON is Jacaranda’s unique study, revision and exam preparation tool. Students can rely on Jacaranda’s dedicated customer service and support. This resource is a hard-copy student text that includes the eBookPLUS and studyON VCE Specialist Mathematics Units 1 and 2.
studyON for Units 1 and 2 is a comprehensive study, revision and exam preparation tool that delivers proven learning outcomes.